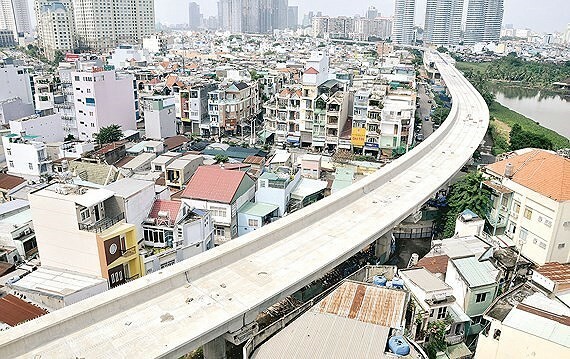 Ho Chi Minh City leaders are calling for investment to build civilized urban residential quarters with many measures to promote investment, aiming for synchronous infrastructure construction as per plan. The Managing board of the Thu Thiem new urban area is pushing up investors to boost implementation of major traffic projects including constructing four main roads; constructing infrastructure for the residential blocks in the city’s north gate and finishing the axis road North-South, implementing the project of Thu Thiem 3 and 4 bridge and flyover as per the Public-private partnership model. Meantime, the managing board of the new urban area in the South of the city has cleared 1,750 hectare accounting for 63.52 percent and leveled around 1,300 hectare. Moreover, it has built relatively perfect infrastructure and traffic system including 17.8km Nguyen Van Linh revenue. Projects of universities started construction. Public construction and residential quarter construction in the area account for 1,000 hectare with the rate of 36 percent. The new northwest urban are in the one and second stage of construction; the managing board is selecting investors and consultants as well as dividing the area into sections. It is scheduled to conduct a bid in early 2018. The managing board is waiting for the approval of the municipal People’s Committee of investors for the project of roads along canal No.8, upgrading project of Tam Tan road and intersection construction project into An Ha bridge. Deputy Chairman of People’s Committee in HCMC Tran Vinh Tuyen said that one of barriers in urban renewal and implementation of residential block building projects is capital and fund for apartment of the resettlement buildings. 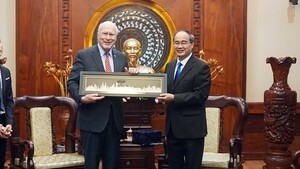 Ho Chi Minh City keeps 23 percent of its annual revenue, with the remaining added to state coffers. But this was cut to 18 percent for the period 2017 - 2020; therefore, investment in growth and infrastructure will be cut also. Worse, from July, 2017, the World Bank stopped providing its ODA to Vietnam. Subsequently, the city Party Committee and People’s Committee agreed to call for social contribution in urban renewal projects and growth projects. At present the city has 73 projects in need of implementing; hence, it needs to sell land to take VND200,000 billion to pay for investors.